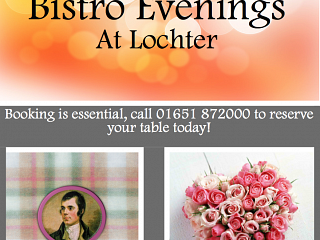 What with Robert Burns and Valentines just around the corner, we decided to host a couple of Bistro Evenings at Lochter. Celebrate Robert Burns with a tasty meal with family and friends at Lochter, choose off our Scottish themed menu and enjoy a few glasses of wine to accompany your meal. The Valentines Bistro is not just for couples to enjoy, why not enjoy the evening with a group of friends, any table size can be booked on Saturday 13th February.